We’d like to say a huge ‘congratulations’ to Matt Doe for his amazing achievement competing on a global stage during WorldSkills 2017. Matt, from Rogers Restorations in Somerset, was part of Team UK and took part in the electrical installation competition against 36 other young electricians. 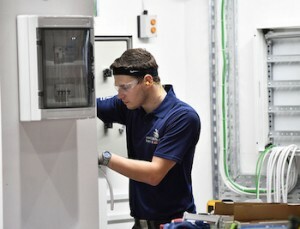 Having triumphed through regional heats and the national final of SkillELECTRIC in 2014, a Team UK selection process and months of intensive training, Matt was one of 34 young apprentices (or former apprentices) – who completed four days of competition at the 44th WorldSkills Finals this week. More than 1,200 young people, from over 50 nations, who are specialist in 51 different disciplines from hairdressing to aircraft maintenance, plumbing to 3D Games design, competed for gold, silver and bronze medals. Carolyn Mason, NET chief executive said: “This is fantastic achievement and the industry should be proud of Matt, what a great experience for him. We need more colleges and employers to support young people and give them the opportunity to showcase their talents through these competitions.